WASHINGTON — In his second State of the Union address, President Donald Trump focused heavily on foreign policy, immigration, and the need for a border wall while completely ignoring the environment and climate change, reflecting the issues important to his supporters. 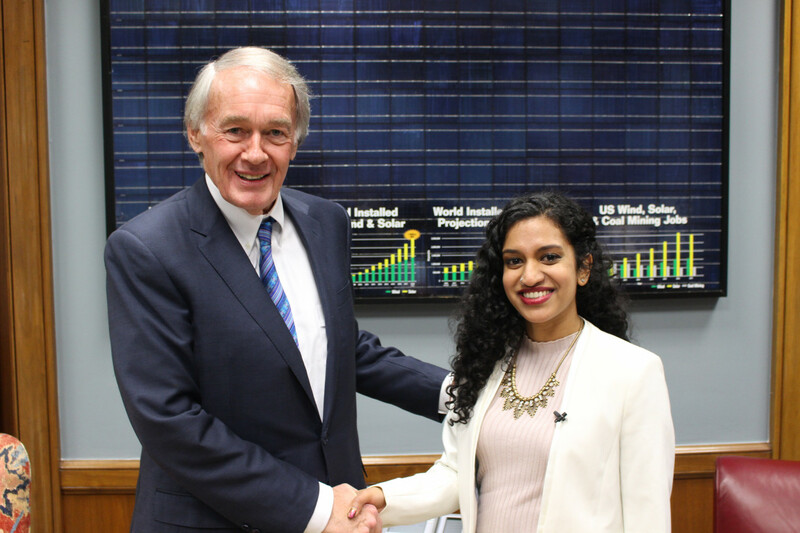 Sen. Edward Markey, D-Mass., brought environmental activist Varshini Prakash to the State of the Union as his guest. Prakash is a co-founder of the movement Sunrise, which gained national attention when hundreds of activists protested outside House Speaker Nancy Pelosi’s office after the midterm elections demanding that Congress support their Green New Deal. Incoming freshman Rep. Alexandria Ocasio-Cortez, D-N.Y., upped their visibility when she joined the protesters. “On the most important issue facing our country and its people – climate change – President Trump’s State of the Union was as empty as his schedules,” Markey wrote in a press release after the speech. “While temperatures rise and wages fall, President Trump continues his climate denial, letting Big Oil, King Coal, and the Koch Brothers dictate an energy agenda that endangers public health, national security, and economic prosperity. Instead of Trump’s climate raw deal, America needs a green New Deal that transforms our economy, delivers justice, and unleashes the greatest blue-collar job creation program in a generation. The Environmental Protection Agency has eased sulfur dioxide regulations on coal plant emissions. The Interior Department has eased restrictions on oil and gas drilling on protected habitat in western states. The Bureau of Ocean Energy Management issued the first permit to begin drilling in the Arctic’s Beaufort Sea. And a ban on the pesticide chlorpyrifos, which is in the same class of chemicals as sarin gas, was quashed by the scandal-plagued former head of the EPA, Scott Pruitt, in one of his first acts as director of the agency. One day before the government shutdown in December, Trump issued an executive order to the Interior and Agriculture departments to ramp up logging on federal lands to 4 billion board feet, an increase of 31%. Trump has repeatedly stated on Twitter and in interviews that poor forest management is responsible for wildfires, though experts disagree. Last week, Director of National Intelligence Dan Coats testified before the Senate Select Committee on Intelligence about the 2019 Worldwide Threat Assessment. Coats oversees the Office of the Director of National Intelligence, which integrates the work of 17 organizations including the CIA and departments of State, Defense, Justice, Energy, Homeland Security, and Treasury as well as the Coast Guard and Drug Enforcement Agency. For the third year in a row, the ODNI report highlighted global threats posed by climate change alongside threats posed by China, Russia, weapons of mass destruction, and terrorism. A January 2019 report on climate change risk by the Department of Defense reviewed 79 military installations and found 53 at risk of recurrent flooding, 43 vulnerable to droughts, and 36 at risk of wildfires, with many installations threatened by more than one risk factor. Desertification and thawing permafrost were other risk factors.